you can rent Villa Mariposa. There are many great places to visit while you stay in Celestun, Mexico! 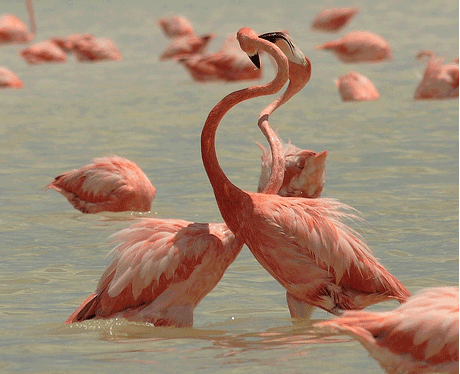 Celestun Flamingo boat tours are about two minutes away from Villa Mariposa. On these tours you will learn about the Gulf of Mexico, the trees, the fish and the birds. There are bilingual guides that will take you within one hundred feet of the beautiful pink flamingos. 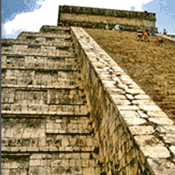 No trip to the Yucatan is complete without visiting Mayan Ruins. They're everywhere! The locals will tell you which ones are the best, and there are signs for them in every town. Cenotes are the most amaizing pools in the world. The water is warm and fresh, but that does not even begin to describe them. To swim in one is a magical experience. 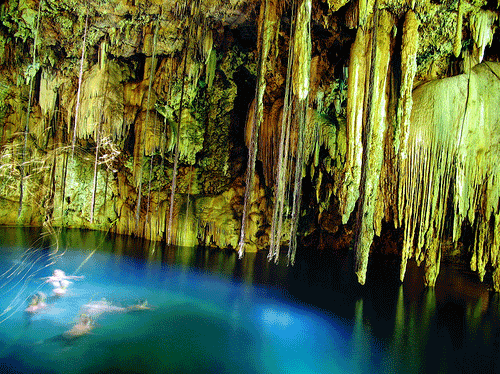 The word cenote is a Spanish corruption of the Maya ¢onot. As the drainage of Yucatan is subterranean and the ponds of surface water are unfit to drink, the water used is drawn either from cenotes or artificial wells. In Maya, cheen, which means an artificial well primarily, is also another name for a cenote, hence the name Chichen Itzá, which means the mouth of the well of the Itzá.